Turns out I have some spare time to pull my thoughts together today, so hi! I'm traveling for work again, down in Orange County, CA. The trip is for three weeks but Fern is coming down for the week in the middle, so the second week will be equal parts debugging and Disneyland, upgrading servers and Universal Studios. Flying into LAX I had the realisation that everywhere I go is an hour away from a major airport. I live 1 hour from Toronto Pearson, Hamilton NZ is 1 hour from Auckland International, whenever I go to Houston, it's a 45 min cab ride downtown, etc. More businesses need to be near airports. To get to rental cars at a large airport you generally get onto a bus or train, which takes you to the off-site lot. I waited for and got on the Avis bus and sat down in a row of five seats, between two men in business attire, two seats to my left and right. The guy on my left was a larger gentleman with a briefcase on the seat next to him; the guy on my right was wearing a black turtleneck with suit jacket. At the next stop a family got on board, including a baby carrier and a small duffel bag. The driver tried to volunteer to put the duffel bag on the luggage shelf but the woman said "There's a dog in there". This wasn't a Paris Hilton-esque handbag; it was fully zipped up with no evidence of holes or windows! Guy On My Right said "They bought the whole family, kids and the dog". I obviously misheard, as I said "There's a dog in that bag, too." He said, "That's what I said". I said "Oh." At the next stop, another couple got on, and I expected they would want to sit up the front so as not to need to climb over the baby-and-dog show. However, they chose not to, and found seats down the packed end of the bus. I made a comment to Guy On My Right to the effect of "Fine, I'll stay sprawled then". He said, what did you say? - I said "stay sprawled out over these seats". He said, "Oh". We didn't try and speak to each other again. My hotel room is 321, and when I was waiting at the elevator, I saw it was 3:21pm. I love coincidences. At 4:30pm the bedside clock radio alarm went off. Who sets their hotel alarm clock for 4.30pm and leaves it? Note to self: always check the alarm time first thing on arrival. I set it for 7am. Then it went off again at 7pm. Second note to self: make sure the idiot before you got AM and PM the right way around. I have, however, found a good use for the clock radio - I drove past a big digital billboard advertising 100.3 The Sound, announcing it was playing "One Tree Hill" by U2. An album track on commercial radio is a bit odd, so I listened further - turns out to be a great music station. Later that evening I was listening to Chris Cornell presenting "My Turn", rocker-plays-DJ for the evening, and amused to learn that "Ladies of the World" by Flight of the Conchords rates up there in Cornell-world. The next morning I entered half-asleep-half-awake state at 5am (my body clock's 8am) with a dream I was listening to a Flight of the Conchords interview on the radio. It felt strangely real. What else to do on a Sunday evening while eating dinner? Watch TV, of course. It's hilarious when it's highlights and they aren't speaking English. It's just sad when it's "soccer moms" vs "hip hop dancers". And that ain't "human tetris". This is human tetris! Apple founder Steve Wozniak (the larger, bearded Steve) is competing in Dancing With The Stars, and according to the Internet he's woefully bad but puts his heart into it. Sounds like Rodney Hide! However, you know how cults of celebrity work, especially ones that can figure out how to ballot-stuff, and he's likely to get the highest audience vote week-to-week. I watched the first few minutes of the elimination show before realising that I found watching dancing completely boring, and further, this show had aired 3 hours ago on the east cost, so I could just go to the Internet and read the results. Which I did. Woz remains, no watching required. Getting a little slower with updates these days it seems. After the failure to get to the Statue of Liberty yesterday, we headed out early, were in a good position in the queue when the day started - but the ticket counter didn't open up, due to the fog. The ferry to Liberty Island gives you another great view of the Statue. Airport security has nothing on Lady Liberty - as well as the standard metal detectors, you have to go through an explosives detector, which blows air at you from all directions before having a good old electronic sniff. After that you end up in the gift shop where all backpacks have to be stowed, and then you can head into the monument (the pedestal on which the Statue sits). The monument contains a museum detailing the history of the statue and its gifting from the people of France to the United States. You can see the design iterations, some of the moulds, and scale models showing the structural armature inside the copper statue, designed by Gustave Eiffel of "Tower" fame. Once through this, you climb the stairs to top of the monument, just under the base of the Statue proper. Since September 11 you have only been able to go to the top of the monument, and not up the statue itself. They don't just blame terrorist threat - it was mostly due to the fact there are only two small spiral staircases, and in the event of a fire, there's no guaranteed safe way to get down. A shame, after hearing tales of people who used to go up to the crown. Good views of the city, lots of tourists. We bumped into a couple from Tauranga, who commented on my shirt in a very Kiwi fashion! But as interesting as the statue is, for some people, it's all too much. It was good we got through when we did, because as we were leaving the Fuzz turned up; apparently the Statue was closed off for a little while afterwards. Next stop on the tour is Ellis Island, immigrant processing center. If you have family in the US you can quite often trace your lineage to here: without, it's not that exciting, and a little hard to imagine what it was like at some times. As much as there were people there trying to swindle you, and who could turn you back home if you didn't bribe them (or if you failed a medical test), it actually seems the US was a much more inviting place to immigrants back then than it is today. Now, on to the fun part. 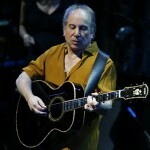 It just so happened that Paul Simon was playing a month long "tribute residency" at the Brooklyn Academy of Music during the month we were in New York. I had spent an inordinate amount of time on Craigslist trying to get tickets, and as is the way with scalpers, it seemed $100 tickets had a market value of $300. However, tonight, not two hours before the show was due to start, I found a guy that had some tickets advertised at face value. I called, and he said I could meet "his guy" at Times Square. The entire process seemed more than a little illegimate, and I was almost expecting to have bought fakes and be left sitting outside the theatre. On top of that, it was now about an hour until the show started. The train ride out to Brooklyn took forever, and we ended up missing the first song. Not to worry, as we were admitted after this - not only were the tickets perfectly legitimate, but they were about three rows back and two seats in from dead centre. You couldn't ask for better. The theatre would not have been out of place on Broadway, but unfortunately cameras were strictly off-limits (Rolling Stone have a photo gallery from one of the shows). The month-long residency was split into three shows: a performance of his ill-received Broadway musical "The Capeman" played earlier in the month and a more generic Greatest Hits selection aptly titled "American Tunes" was due to play later. We got to see "Under African Skies", a show dedicated to the Graceland and The Rhtyhm Of the Saints albums. Being a "tribute" show, it was Paul Simon and Friends, including Ladysmith Black Mambazo, and David Byrne (who did a perfectly quirky "You Can Call Me Al"). Not all of the African and South American singers quite understood Simon's unique lyrical phrasing, and while I was stoked to hear songs like Can't Run But and Spirit Voices performed, it seemed a waste that Paul wasn't singing them himself. His backup band was as had been for the last couple of tours, and it was great to see legendary session drummer Steve Gadd. Cross another off the "see before you they die" list? It'll happen.. Nick Mason will see to it! But until then, look at the Day 8 gallery. The footprints of the Rockefeller family are all over New York City. They purchased 17 acres of land in downtown Manhattan in the late 1940s, and donated to the City, who then donated it to the world in the form of the United Nations. Even though it has its own security force, the NYPD look after the border, which is guarded by Jon and Ponch. We found a nice place in Café Metro to have lunch, and Det. Stabler from SVU wandered past the window. This wasn't entirely unexpected, as the neighbourhood was plastered with signs suggesting that the show was shooting, and trailers blocking off streets. Unfortunately, we couldn't find him again, which means we're not very good stalkers. Instead, we took a little more time to look around the famous Grand Central Station, which we last visited on Day 2. Next stop: Wall Street, via Trinity Church. You could see a lot more here on September 10, but these days you can only wander around the outside of the stock exchange, under armed watch. You can still go into the Federal Hall National Memorial, which is run by the Department of Conversation (or National Park Service as they're called here). It is the place where George Washington was inaugurated, and the Bill of Rights was signed. There wasn't much to see at the World Trade Center site - not much of a memorial or anything. Saw a Jewish guy on a skateboard, though. Of more interest to people in the area is Century 21, a discount department store. With a big day under the belt, we wandered down towards the South Street Seaport, to have a look around. From here you get a good look on the Brooklyn and Manhattan Bridges. There are a great number more photos on the day's gallery. We needed some groceries, so we wandered around our adopted neighbourhood a little in the morning. On the way to the Korean Supermarket on 32nd St we found Jim Hanley's Universe, a Mark-1-on-steroids where Fern could relive her childhood through Tintin Asterix. Every other shop in the neighbourhood is a souvenir store, but this one wins for most statue-ettes. Some things at the grocers were a little reminder of home, and others were just a little strange!. I thought the British liked queueing, but this beat it hands down. We never found out why. At least they all had Bubble Guy to entertain them. Greenwich Village, home of the rich and famous, location of Friends, although I never saw Monica or Ross picking up a copy of the PKWARE user manual from a street vendor! We walked around the outside of the NYU campus, around Bleecker St, the home of music and culture immortalized in song by Paul Simon. I particularly respect their order of national prioritisation! The Village is the home of the narrowest building in Manhattan, at 2.9m wide (number 75½), and next door at 77, the oldest building in the borough. Even regular width houses are hard to send mail to here. Parking is difficult also. It's also home to a loud and proud gay district, which, as always, has its finger on the pulse of culture - only one week after the event. We thought we'd check out the TKTS booth down in Times Square, and got half price tickets for the Monty Python music "Spamalot" literally 2 minutes before it started. Last minute tickets are invariably in the nosebleed section, but we enjoyed the show nonetheless. When Spamalot first premiered it was full of talented actors Tim Curry, Hank Azaria and Niles from Frazier. All we got was Clay Aiken from American Idol. Afterwards, he attracted a large stage door audience (and was probably the owner of the limo), but we left before he did. The counterfeit bag crew were out in Times Square also, but we managed to make it past the throngs of crazed bargain-hunting women and back to the subway toward home. Breakfast, then off to the subway to head down to Chinatown. The back streets of Chinatown are full of childish laughs, arguments, odd looking food and things to buy. I was on a mission to find a plate of kwai teow, the fantastic food described as "cholesterol on a platter". Possibly my favourite food ever. Not a lot of hope, before finding a Singaporean restaurant which served me up this piping hot platter of awesome. Canal St, the main street of Chinatown, is full of counterfeit everything. While one store was noticeably shut down, there were dozens more where that came from. Guys on the street offered to sell you Rolexes and iPods, and every store was full of sunglasses, perfumes and handbags. Dolce and Gabbana seemed the brand of choice - all manner of brandless bags were labelled with the same little triangular logo, and no-one hid those. If you knew what to ask for, they'd let you go out the back and look at the Chanel bags, but asking for Louis Vuitton got you looked at suspiciously. We had to take two attempts, with a little Chinese lady telling us "no pictures! $10 for picture! ", to sneak this Kanye West inspired photo. From here, we headed down to Battery Park, grabbed sweet refreshment, and stared out at the lady of the harbour. From the free ferry out to Staten Island, one of the five boroughs that makes up New York City, you get a great view of the Statue of Liberty and boats on the harbour. (And birthday girls.) The return trip gives ample opportunities for photographs of the Manhattan skyline. Day 3's gallery has many more harbour shots. Day 2 started late, and we went to the famous Dining Concourse in Grand Central Station for lunch - or, seeing as I'd managed to pick up a nasty and painful sore throat a few days before leaving, a soothing smoothie. The Metropolitan Museum of Art is on east side of Central Park, near the famous reservoir. The outlook of the day was a little bleak, but still impressive. Entry to the museum is by donation, and you can pay as much or as little as you like. However, we didn't know you actually did have to pay something, because we pretty much just walked right in! Apart from the standard wing of paintings, the museum has a lot of interior design, sculpture, armoury, musical instruments, and other forms of art. I spent a lot of time looking for the unicorn tapestries, having seen copies being traditionally made at Stirling Castle last year. I eventually found out that these were at the Cloisters, a gallery of medieval art we would have to see another day. Another Jesus Dali - this one a bit more space-age. (I'm collecting them for Tony). Artistic androgyny - one is a boy, one is a girl. Can you tell which? I love the description plate that comes with this piece of art. Puts "oil on canvas" to shame. Day 2's gallery is full of art. Fern's birthday was in early April, and she had always wanted to go to New York City. What better birthday present than ten days in the big apple? First, the logistics: driving to Buffalo, NY takes about 2½ hours, and shaves several hundred dollars off the cost of flying. A couple of JetBlue tickets (a low-cost US carrier) ran about $200 each, including tax, compared to the ~$600 each Air Canada would have charged out of Toronto. Accommodation was an interesting dilemma, also neatly solved by the Internet. We found a listing on Craigslist put up by a woman named Lamia, who wanted to rent out her apartment while she was away for 10 days - almost exactly the 10 days I had wanted to take off - and made quick arrangements by e-mail, followed by slow arrangements by money order and post. We had a little problem driving across the border. You know when you pass through the US, and get given one of those little green cards, part of which you're expected to keep? No-one ever explains why, or what it actually does. It's a visa waiver, which lets you enter the country without explicitly being issued a visa, and it's valid for 90 days. If you re-enter the country less than 90 days after leaving it, and don't have the green card, you're in trouble. They actually make you pay $6 for its re-issue after they're convinced you're not going to be bad. Hint: don't say "we've rented an apartment", because even though you mean "for 10 days", they hear "forever". Buffalo Airport was pleasantly simple - you still get the checks on US domestic flights, but they'll let you on even with just a strange looking drivers' license, The flight was peaceful (the seat-back TV, instead of being on-demand, was live satellite TV, so I watched a little Battlestar Galactica and followed the US election on Faux News) and after just over an hour, we arrived at JFK. In a complete contrast to Toronto's useless transit, JFK has a simple link with the NYC subway. Strangely, you pay $5 for the 10 minute AirTrain ride from the terminal to the subway station, and then $2 for the 45 minute subway ride into Manhattan. The subway was stereotypical - by the time we got to the line we needed, both carrying suitcases and carry-on bags, we were abused by New Yorkers for taking up too much space. After a couple of changes it was a two-block walk to the apartment. Lamia's room-mate is a painter named Russell, who met us at the apartment and told us a little bit about things to do. Unfortunately that was the last time we saw him, as he only came down to NY for the weekends. Check out the gallery for day 1 (including lots of great photos Fern took from the plane).